Since there are a few englishy people who read this, I thought that I would pose a question that I have asked before. I believe that I got some sort of answer a while back that satisfied me (thanks Mom, Toby and Lindsey), but I have forgotten it by now. 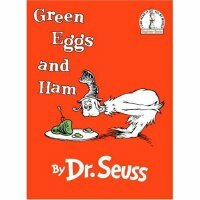 In Dr. Seuss' Green Eggs & Ham, should the "green" describe both the eggs and ham? Or is it just green eggs and regular ham? Well, according to his illustrations, the green describes both eggs and ham. What if I have a sentence that states, "Look in the sky, there is a pink bird, airplane, and UFO!" Does this mean that I am calling the UFO pink? This isn't just nonsense for me. Working in government, I have to read a lot of laws. These laws often list many options or exceptions. To read them legally, I would like to know how the English language works. This would show that pink only applies to the bird, not the airplane or the UFO. Is there an English rule for this situation? Unfortunately, it shall remain ambiguous. I don't think there is a way to distinguish what is meant. Ideally, if the writer wanted to emphasize that both were green, he would write "green eggs and green ham." 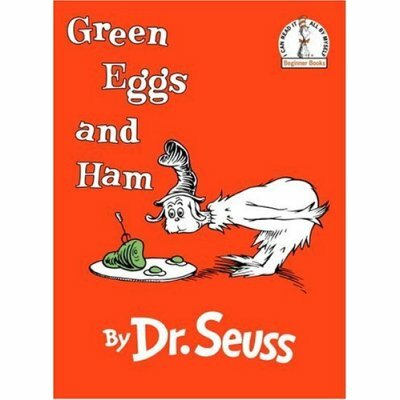 If he only wished to indicated green eggs, but normal ham, he would write, "green eggs and ham." It can go either way, and it's up to context to determine the meaning. I like fuzzy teddy bears and oranges. I can't remember what we decided before, but i'm with peaby on this one.